The Tampa Bay Lightning honored Heather Barrow as the 38th Lightning Community Hero of the year during the first period of tonight's game against the Toronto Maple Leafs. 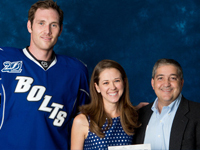 Barrow, who received a $50,000 donation from the Lightning Foundation and the Lightning Community Heroes program, will donate the money to High Risk Hope, St. Joseph's Foundation and the Junior League of Tampa. Heather's commercial for St. Joseph Women’s Hospital. Heather's personal experience inspired her to found High Risk Hope, a foundation that provides support, encouragement, information and resources to women and families who are experiencing a high risk pregnancy resulting in potential premature birth and neonatal intensive care after delivery. High Risk Hope was featured on WFLA channel 8.